Wall Street pundits love coming up with acronyms and catchy phrases for what they favor in the markets. While this style of reporting can make for good headlines, investors often pay more attention to the hoopla than to understanding the facts. One recent example occurred in the spring and early summer of 2015. Interest rates were near record lows and the Dow was continuing to make record highs. As a result, the pundits on CNBC began telling the public to plow into the stock market because “What else are you going to do with your money?” Almost overnight this became the mantra-of-the-moment across the financial press. Around the same time, high-profile CNBC commentator and “Mad Money” host, Jim Cramer, invented the acronym “FANG.” FANG stood for the hottest of the hot stocks – Facebook, Amazon, Netflix and Google. In late July, as Netflix, Google and Amazon reported earnings, their stocks rose 18, 16 and 21% respectively in one day and the cheering of “FANG, FANG, FANG!” could be heard all over CNBC. The music stopped in August and September when the markets experienced a harsh selloff and FANG investors suffered worse than most. Did that stop the financial media from cheering on FANG? No. As the markets stabilized and subsequently rallied in October and early November, the leaders of the rally were, you guessed it, FANG. In fact, FANG accounted for most of the indexes gains from the lows. Of course we know January and February of 2016 wiped out all of those gains, and more, as the indexes sank to lower lows – down 13% from their 2015 highs. As the markets trudged back from those lows and eventually went on to make new highs, one thing was missing. The pundits stopped recommending FANG and stopped chanting “What else are you going to do with your money?” The financial press needed a new acronym to embrace and, as a result, T.I.N.A. became their new darling. T.I.N.A. stands for “There Is No Alternative,” as in, due to low yields on bonds there is no alternative to investing except in the stock market. The recommendation is for investors to abandon their government-guaranteed and high-grade corporate bonds due to almost no yield, in favor of higher yields in utility and dividend-paying stocks and high-yield corporate bonds. Record inflows of capital from individual investors poured into these investments. For example, Vanguard Dividend Fund saw $3 billion of new investor money come into their fund in six months. Utility and dividend-paying stocks and high-yield bond indexes have been the best performers in 2016. Depending on when an investor heard the T.I.N.A. story and subsequently invested, they may have done well. However, what is missing in this new mantra is the caveat of the risk inherent in utilities and dividend-paying stocks and high-yield bonds, as opposed to government and high-quality corporate bonds. On July 29th, 2016 Vanguard took the unprecedented step of closing its $30 billion fund to new investors, with the simple statement that utilities currently selling at 22x earning per share with only 5% revenue growth cannot sustain the yields and are therefore overvalued. (See: http://www.cnbc.com/2016/07/29/vanguard-dividend-fund-shuts-out-new-money.html) On Wall Street, that is called risk. Vanguard did the right thing by speaking the truth and revealing the fundamental reality which is always missing in cute acronyms and catchy phrases. They recognized they have to take higher risk to offer the same yields investors have been chasing and were not willing to do so under current market conditions. The message should be simple. Beware of cute acronyms and catchy phrases espoused by Wall Street pundits in order to tell a good story. By the time you’re hearing or reading about it, it is probably too late and too risky. 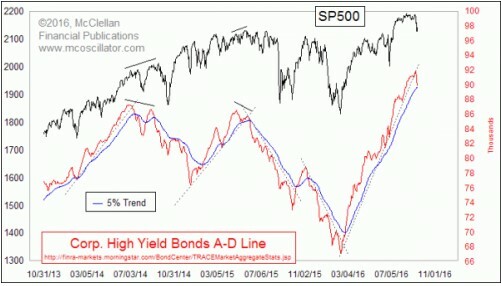 (See Corporate High Yield Bond Index chart below.) This is where Manchester Financial and our professionally-managed portfolios can help. Our Investment Committee has over 125 years of experience. We have seen these and many more examples of mantras-of-the-moment in our careers and stick to our fundamental core of protecting and growing client portfolios rather than chasing the shiny new acronym or phrase. Please share your favorite investment acronyms and phrases you’ve heard, or any questions you may have, the next time you speak with a Manchester Financial advisor. The Corporate High Yield Bond Index has gained 19% from its February 2016 low, but is currently violating its uptrend (dotted blue line) and is near to going lower than its 5% trend (solid blue line). These are warning signs of potential problems with high-yield corporate bonds. John Bossler is the General Manager of Manchester Financial, an Investment Counsel/Wealth Management firm located in Westlake Village. For more information call 800-492-1107. This entry was posted in Markets and tagged CNBC, Corporate High Yield Bond Index, FANG, Jim Cramer, Mad Money, There Is No Alternative, TINA, Vanguard Dividend Fund. Bookmark the permalink.